Going to the St. Valentine Car Show yesterday in Corona, California, was a good way to spend a couple hours, but my camera operations went sideways. The temperature had climbed to 80 Fahrenheit (26.66 Celsius) by 1:30 pm, so I packed the leather jacket in the saddlebag in case there was a sudden weather change and rode to Corona in a short sleeve shirt. The photos in this post are from the Panasonic Lumix FX01, the camera I carried as a backup. I’ve been having intermittent problems with the 2nd Nikon FG. Film transport system problems. I thought for a time that the incredibly bad spacing problem I had on one roll of black and white film was an anomaly, possibly caused by the way I loaded the film. But that proved to be wrong at the car show yesterday. I shot one roll of black and white with the camera, then started loading another roll and the film winder froze up. I took the FG back to the bike and grabbed the FX01. That point & shoot camera was originally bought for me by my wife Lisa, but she nearly always has it in her car, because she likes it and uses it frequently. She hates the P&S camera I bought for her some years ago, a Canon. It has a long shutter lag time. My grandson and I occasionally use that camera. Funny how things work out sometimes. Lisa has been using the camera somewhat more effectively than I thought, because after I shot the photos shown here, I discovered that she had most recently shot a number of frames indoors and had changed the camera’s white balance to adjust for incandescent light. I didn’t think to check the white balance setting on the camera and as a consequence the color of all of the frames I shot is quite whacked out. I managed to adjust the color of the frame showing the paint on the gas tank, but the other two photos show the subject (slightly) better in black and white. I met Tim Devantier at the show and after a couple hours we decided to leave. Like a true desert dweller, he had parked his bike under the shade of a tree. I had parked in the open on the opposite side of the lot. 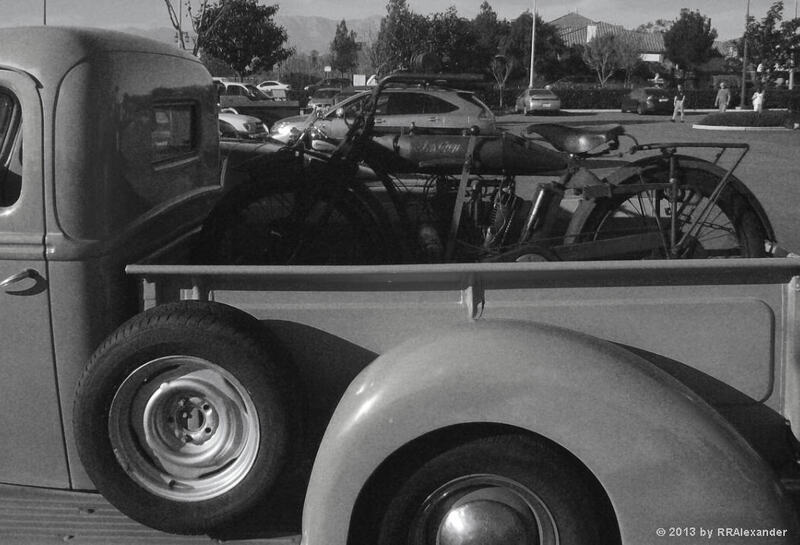 When I walked through the classic cars toward my bike, I discovered that a newly arrived show vehicle, a pickup truck, was now parked a few spaces away from my bike. The pickup truck was painted a beautiful bright yellow. But the truck’s beauty paled by comparison with the cargo it was carrying, a 1913 Indian. 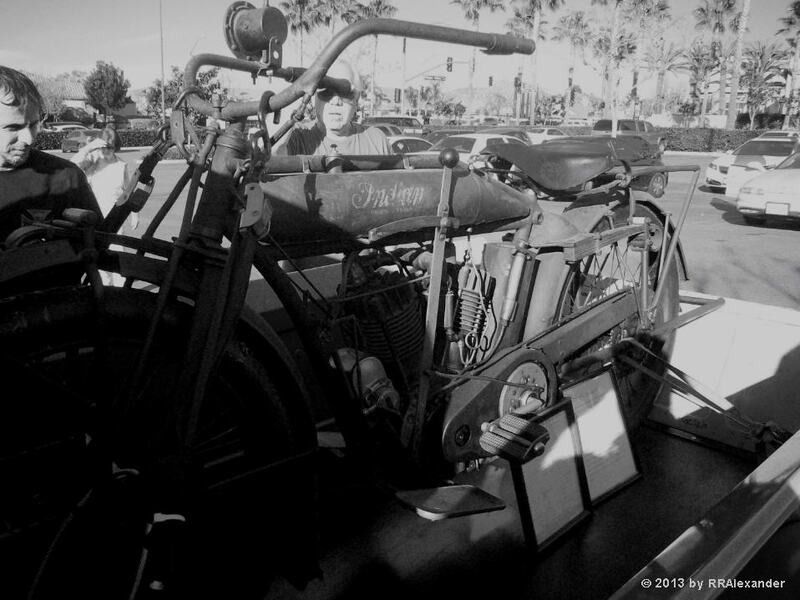 This Indian was bought new by E.F. Harmon in Tucson, Arizona. He worked in silver and copper mines and was also a blacksmith. He rode the Indian until a part of the clutch broke in 1922. 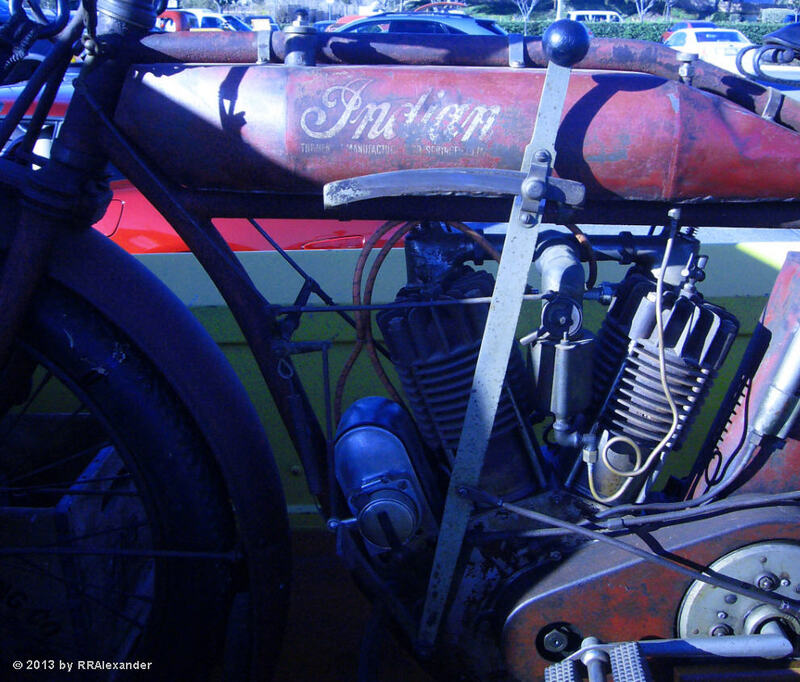 In 1924 the family moved to Fullerton, California, and the Indian was stored in the garage. In 1962 his son started to work on the motorcycle. He had to use a hacksaw to remove the petrified tires from the rims. Because no one made antique motorcycle tires at the time, he replaced the originals with Chinese Rickshaw tires, which were slightly smaller and had to be stretched to fit the clincher style rims. He machined the replacement part for the clutch, cleaned the carburetor and gas tank, and replaced the spark plug wires. The motorcycle still runs, 100 years after it was originally built.